It's definitely time to be thinking about upcoming shows and exhibits. You can find a couple of listings on my website: http://www.wooldridgeequineart.com/. There are two other possibilities as well, but I'll wait to make sure things will work out with them before I say anything. I hate to backtrack, don't you? Backtracking has been going on here a lot in the past week. That's just another way of saying Tax Time is here again...and every year, in spite of the best of intentions to start at the first of the year, I find myself in the third week of March, sorting the year's sales slips, putting them in their little month-by-month piles, and entering them in the book. So there I go, all the way back to January. We're all in the same boat. Naturally, I don't begin to think I am alone in this. I'm just saying that if I had followed my plan---my every-year plan that never is put into motion---the book would be completely up-to-date, just waiting for its annual trip out the door to the tax man. My plan? To do what true business people do: enter the income and expenses At Least once a week. More often would be even better. I have to think about it all year anyway, so why not know that it's In Progress. Oh, how great! Just add the columns in January, make an appointment (won't my tax preparer be amazed when next year he gets a call from me, IN January, for an appointment. Yes he will be. Because he will get one.) And then, rather than this nonstop sorting, piling, adding and storing away, I will know exactly, and 'way ahead of time, that all is in place. Think of all the brain space this frees up for better things. That means I can enjoy the Tax Trip, leaving early to carry out my plan to take photos of the subjects of interest I passed, rushing and cameraless, true to form, THIS year. Thick and knobby old trees with their shadows, and the old farmhouses and older barns, will still be there next week when I make the repeat trip to pick up the book and a copy of the tax return, though the snow has melted considerably since last week. The snow with purple shadows across it, was half the subject last week. I'll take the photos, as this year's route was somewhat different from last year's, with variations on the trees, houses and barns. I can add snow if I want. Sometimes I think the snow photo is better than the painting done from that photo, simply because the moment captured on film is true, whereas in the painting there might be many changes. (I 'm one of those people who leaves photos as they are, whether digital or on film. )There are some barns I'd better be capturing before they lean a little too much or too many more boards come off. Even a year can make a difference, so it won't be good to wait. A lot of these things will be good to do in pencil. Most bothersome of all was that there was not enough uninterrupted time to spend on the writing necessary to update my website or this blog, and to concentrate on entering information on two business websites which now, fortunately, are nearly ready. All of this time-is-so-short whining that's going on, is so anyone reading, who might feel the same now and then, will know they are not alone. I will also say; this tone of things, though it may be realistic, will certainly not be the usual way, here. Life's too short for it (a well-known singer and songwriter wrote a line about negativity: "...I say life's too long" for it---he has a point), and there is generally some good in the most negative situations, if only to give us empathy when someone else is in dire straits. So---the sun is shining, always a plus. The air is warmer. The yards have debris from the trees, mainly because of the big ice storm this winter. Still, there is debris every year, no matter how much we rake and straighten things up in the fall. That we can see our messy yards means the snow is gone! We're ready for that, looking forward to spring. We'll work with the good. Welcome to my blog. Obviously, I'll be talking about horses and more---and here's the first example of More! These are Bob's mules. 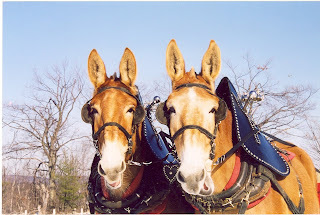 This mule team was part of a sleigh rally held at a lovely farm in Harrison, Maine. During a break in the action I took at least eight reference photos for future use in my pencil art---and became so caught up in getting good, clear details and at least passable composition that I never noticed what they were doing to pass the time as they stood there. When I reveiwed the photos later, I sure found out. They had created new, funny faces for themselves, a different face for every frame. The photo you see, is the one I worked from. The finished artwork gathered some nice awards in a juried show and in a couple of State fairs. A man and his wife bought it at a summer art show and sent it to their mule-owning friends in Georgia. I like this expression so well that I'm working on a second drawing. From anything I have read, it's all right to draw a duplicate as long as the purchasers know that this may happen.